Mars has just received its newest robotic resident. 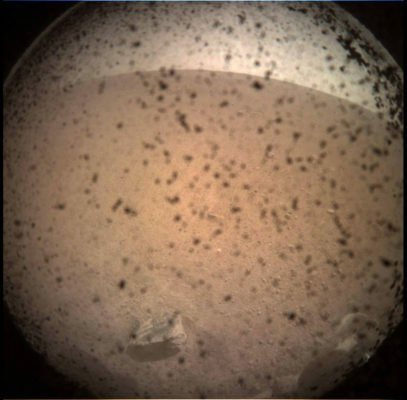 NASA’s Interior Exploration using Seismic Investigations, Geodesy and Heat Transport (InSight) lander successfully touched down on the Red Planet after an almost seven-month, 300-million-mile journey from Earth. InSight’s two-year mission will be to study the deep interior of Mars to learn how all celestial bodies with rocky surfaces, including Earth and the Moon, formed. InSight launched from Vandenberg Air Force Base in California May 5. The lander touched down on Nov. 26, near Mars’ equator on the western side of a flat, smooth expanse of lava called Elysium Planitia, with a signal affirming a completed landing sequence at approximately noon. “Today, we successfully landed on Mars for the eighth time in human history,” said NASA Administrator Jim Bridenstine. “InSight will study the interior of Mars, and will teach us valuable science as we prepare to send astronauts to the Moon and later to Mars. This accomplishment represents the ingenuity of America and our international partners and it serves as a testament to the dedication and perseverance of our team. The best of NASA is yet to come, and it is coming soon.” The landing signal was relayed to NASA’s Jet Propulsion Laboratory (JPL) in Pasadena, via one of NASA’s two small experimental Mars Cube One (MarCO) CubeSats, which launched on the same rocket as InSight and followed the lander to Mars. They are the first CubeSats sent into deep space. After successfully carrying out a number of communications and in-flight navigation experiments, the twin MarCOs were set in position to receive transmissions during InSight’s entry, descent and landing.